Right Foot Down is in the Motor City covering our first ever North American International Auto Show. Day one is winding down, so here’s our quick summary. I always say, surprise your reader/viewer and Buick managed to do that. At a secret offsite reveal in a Detroit warehouse, GM brought us the Avista. And it’s freakin gorgeous. You can see more pictures in our full article. While it’s not all that important to most of our readers, there’s a new minivan in town. Based on…something else probably…it’s called the Pacifica, which was a defunct Chrysler crossover. We managed to get a long-distance shot of the new van, or at least a picture of a picture of the van. They unveiled the Bolt and the Cruze. We weren’t there. The Bolt has a pretty impressive EV range for $30,000 and the Cruze is a nice looking hatchback. Moving on. News at Audi revolved around acknowledging the emissions issue and promising to move forward. To that end, Chariman-of-the-Board Rupert Stadler showed something without an emissions issue the Audi h-tron quattro concept. Zero to 60 in less than 7 seconds, this Audi crossover will go 372.8 miles on a single tank of Hydrogen. No better way to escape CO2, than H.
Apparently VW showed a Tiguan GTE Active concept. We were interviewing someone over at Mazda about their Speedster concept. Big news out of Mercedes is the new E-Class and SLC, replacement for the old SLK We were still at Mazda. Back in the saddle, we made it to this one. Sort of, we were in the back and couldn’t see all that well. 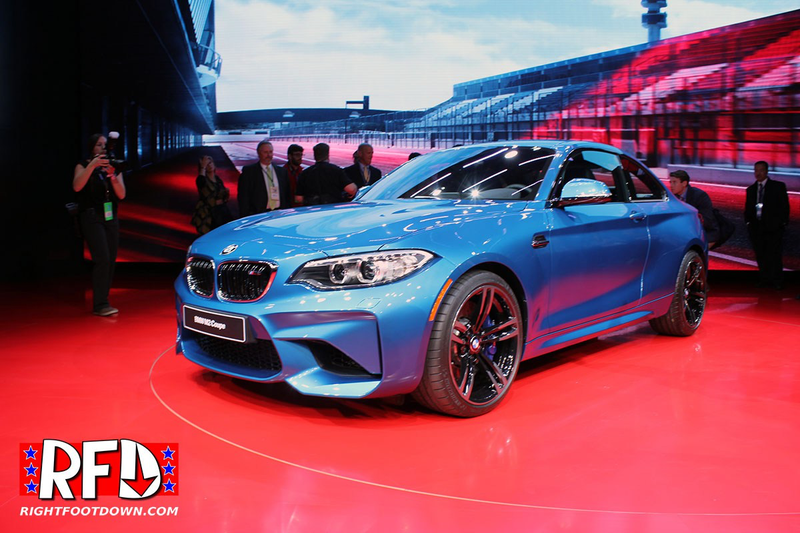 Big news was the new M2 sports coupe, and it’s spectacular. This $50,000+ 2-door will hit 60 in around 4 seconds and harkens back to the old 2002. At least according to the guy who introduced it. Awesome car, we’re a big fan. Want more pictures? Go here. The Swedes are killing it at NAIAS, winning North American International Truck of the Year with their new XC90. They tossed out a new S90 sedan as well. We were camping out at the Porsche booth to get a look at the new 911. There’s a new 911! And unlike years past, this is not an evolutionary design change. This is quite radica…no, it’s not. It looks like a 911 as you can see from our live coverage earlier. When you host a party in your own hometown, you bring it. Ford brought it. Ryan Tap’dancing Seacrest did all the voice over work for their intro videos and than walked out in the damn stage live next door in Joe Louis Arena. Our American Idol helped Bill Ford and Mark Fields unveil the brand new Fusion sedan, featuring various iterations from the new 325hp AWD SE version to the hybrid and Energi plug-in versions. Evolutionary to be sure, but a great looking car. Not to be outdone, Infiniti paraded the man himself out to introduce their new sports coupe, Carlos Ghosn. The head of Renault showed us a gorgeous new direction for Infiniti complete with an available 400hp twin turbo engine. Easily the coolest person in the whole building, Akio Toyoda himself announced the new direction for Lexus. Gone he says are the days of “well made, but boring” and in are cars and vehicles built with passion and flare. Both are present in the new LC-500 sports coupe. This gorgeous 2-door takes the LF-LC concept from a few years ago and improves on it, with a production-ready looking variant. Featuring a 5.0L naturally aspirated engine rated at 467hp, Akio brought us a nice surprise to Detroit and stole day 1 of the NAIAS. There’s a new Ridgeline. Apparently. News from the Korean camp are of a new nameplate, Genesis. Built off of their excellent luxury sedan, Hyundai is finally doing what I said they should do a couple of years ago by building a new brand. I didn’t see the unveiling, but the G90 should be pretty coo. There’s also a new Kia Forte. So far, this has been the Year of the Coupes, and I’m good with that. Seeing production-ready looking enthusiast fare is pretty fun, if perhaps most of the new coupes will be the latter part of $40,000 or more. At least automakers recognize that there is still interest in fast, RWD, 2-door cars. Day one in Detroit certainly makes that seem to be the case. We’re not just covering press conferences, we already have man GB of video footage including an interview with Ken Saward, designed of the awesome Mazda Miata Speedster concept. Keep an eye out on our social media feeds for live coverage of day two. We start bright and early in the morning.